Maybe you’re familiar with this type of response in your personal life, and certainly, most of us experience it in our professional life. It could be your loving partner, your boss, your customer, your kids, etc. In my mind, I imagine a person crossing their arms, leaning back in their chair and shutting down. Not even listening to what I have to say. Can you picture it? These people can push us to our limits at times. Especially, when we’re convinced that we have something they’d benefit from or even enjoy. And what I find most of us tend to do in these situations is get even more aggressive and go into “Convince Mode.” We dig in our heels, raise our voice, and often get defensive. And what does the other person do when you take this approach, they also dig in their heels, become combative, and usually dismissive. These types of conversations rarely end well. Both parties usually feel indignant towards the other. It’s not a good way to try to earn someone’s business. You may have read some of my other articles where I share about people with a high polarity response. The knee-jerk “no” can be a form of a polarity response. However, it can also be someone’s go-to mode when presented with something new. Once you understand this is just a strategy for the person, you can take steps to present information in a way that they are more open to receiving it. For instance, when I have a client with a knee-jerk “no” response to new ideas, I change the way I present ideas. This is an example of applying my all time favorite quote, “Blessed are the flexible, for they shall not be bent out of shape.” Author unknown. Be flexible and willing to change up your approach. Keep the end result in mind. Here’s a suggestion on how you might change up your language when you find yourself in a conversation with a knee-jerk “no” response. Instead of saying, “Here are a few possible ideas you might want to consider.” say, “How about if I present a few thoughts and you can dismiss all the ones that you know will not work for you right off the bat?” Essentially, you’re giving them permission to do what they normally do anyway and letting them know you’re fine with them doing it. It takes the pressure off and keeps the relationship intact. There’s no reason to go into “convince mode” or become defensive when they dismiss your ideas. Here’s the best part, once they know you’re not going to get offended or try to convince them of anything, all of a sudden, they’re more open to considering the idea before dismissing it outright. They’re also more likely to come up with their own idea of how to move forward. This tends to slow down the knee-jerk “no” response and often achieve your end result. 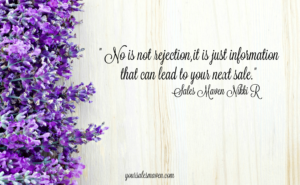 Years ago, I had a boss with a habitual knee-jerk “no” response. When I’d ask him for something special for a client, he’d always tell me “no” at first. However, when I presented it in the way outlined above, he’d start coming up with his own ideas of how to make it happen. The end result was usually my client got what they needed, and that always resulted in more sales for my company. A win-win for all involved. Test it out, tell people up front to dismiss all the ways that your suggestion won’t work for them and see if they come up with a way to actually make it work.